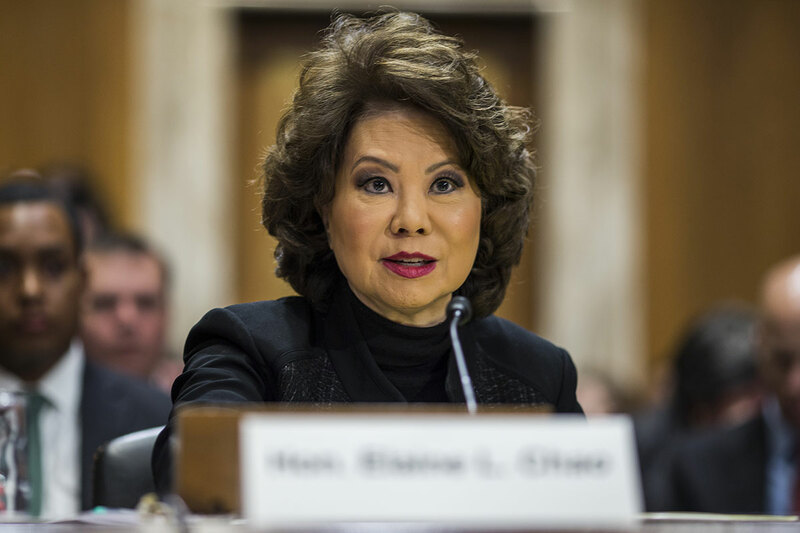 Secretary of Transportation Elaine Chao joined local lawmakers in her home state of Kentucky in celebrating a recently awarded federal grant that will be used to improve an interchange linking two interstates. The Kentucky Transportation Cabinet received a $67 million Infrastructure for Rebuilding America grant to construct auxiliary lanes and a new “double crossover diamond” interchange on a portion of road where interstates 75 and 71 overlap. The two routes share a 20-mile segment of roadway in Boone County, which toes Kentucky’s northern border with Ohio in Cincinnati. The overall projected cost of the interchange improvements is $150 million, the majority of which is supported through the INFRA grant and other federal funds. Some 25% of the project is bolstered by state and local money. “These investments in key infrastructure for Northern Kentucky will increase economic development, improve the quality of life and help create jobs for the hard-working people of this region,” Chao said alongside Kentucky’s Transportation Secretary Greg Thomas and other state leaders during the event on Aug. 24. Also known as a diverging diamond interchange, the double crossover facilitates left-turning movements onto arterial roads while eliminating the need for a left-turn signal at signalized ramp terminal intersections, according to the Federal Highway Administration. There are fewer than 100 double crossover diamond interchanges in the United States, just one of which exists in Kentucky, according to a press release issued by the Kentucky Transportation Cabinet. Boone County is among the fastest growing in the state. Its population of 120,000 is expected to double by 2050, the state said. Several large companies, including Amazon.com, Kroger Co. and FedEx Corp., have announced that they are expanding into the area. According to the transportation cabinet’s engineering study, average daily traffic on the eastbound side of I-75 in this area is projected to grow from 18,000 vehicles to 52,000 vehicles by 2030. Kentucky is the latest stop Chao has made to formally announce a new INFRA grant. Her husband is U.S. Senate Majority Leader Mitch McConnell, who represents Kentucky. The INFRA program makes $1.5 billion available to support highway and bridge projects nationwide. Award winners were announced in early June. The I-71/I-75 interchange project is one of 26 that received grants. Chao was in New Orleans in early August to announce the Belle Chasse Bridge and Tunnel Replacement project that received funding. Kentucky’s grant qualifies as a “large project” because the award sum is larger than $25 million. Other large projects awarded include a $160 million grant that will expand the I-94 North-South Freeway near Milwaukee, a $132 million grant to improve rail connections in the Chicago area and a $65 million grant to widen an 18-mile portion of I-25 in Colorado.